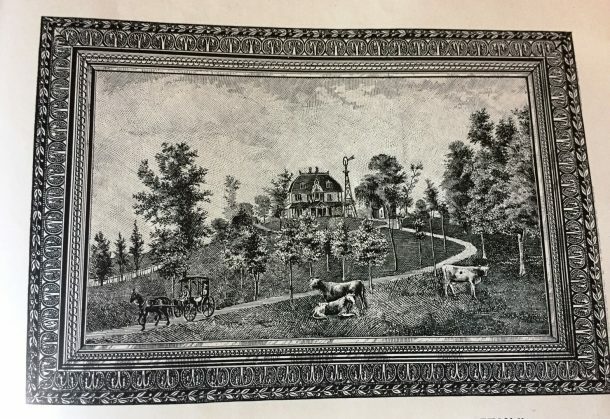 Indianapolis was just beginning to emerge from the pioneer era in the winter of 1853 when a small group of men gathered to establish a new lodge dedicated to Friendship, Love and Truth. One of these men would go on to become a law partner of President Benjamin Harrison. Another would enlist in the Union Army and rise to the rank of Brigadier General. A third would invent an escape-proof jail and establish the neighborhood known as Haughville. 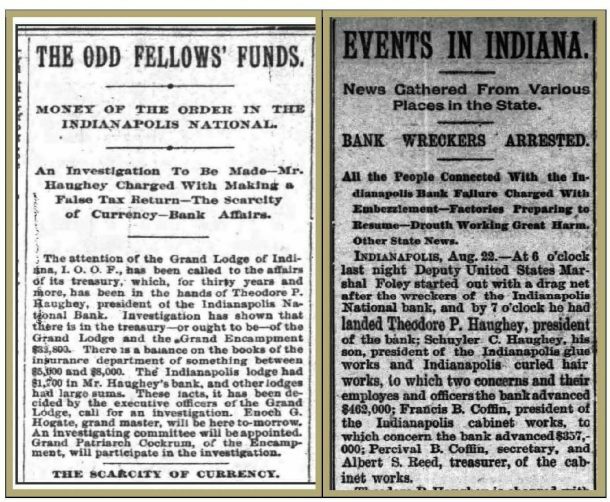 And a fourth founding member of Odd Fellows Capital Lodge 124 – Theodore P. Haughey – would betray his IOOF brothers and perpetrate the largest bank scandal in city history. 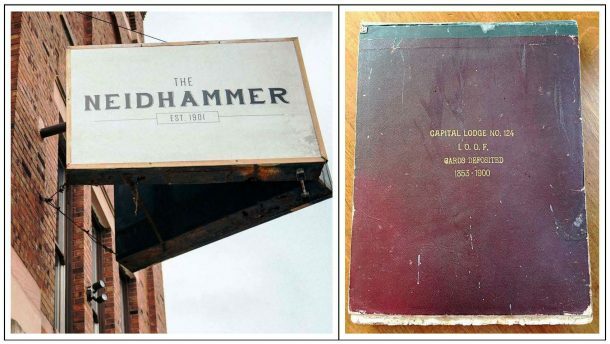 160 years after the founding of IOOF Capital Lodge 124, a worker making some emergency repairs to a dilapidated building at 2102 E. Washington Street found a book in the wall that contained the water-stained membership certificates of its 11 founding members. Curious about the book’s origin, he searched online and found an article I’d written about the Odd Fellows a few years ago. He also saw that I worked at the same law firm as his father. Perhaps, he thought, I would be able to shed some light on the meaning and significance of the crumbling certificates. The building where the records from IOOF Capital Lodge 124 were discovered has been restored and reopened as The Neidhammer. Now, most people might have taken one look at the moldy book with its smattering of pigeon droppings and determined – correctly, as it turns out – that it probably was not safe to handle without gloves, protective eyewear, and a hazmat suit. I am a person with more curiosity than common sense. 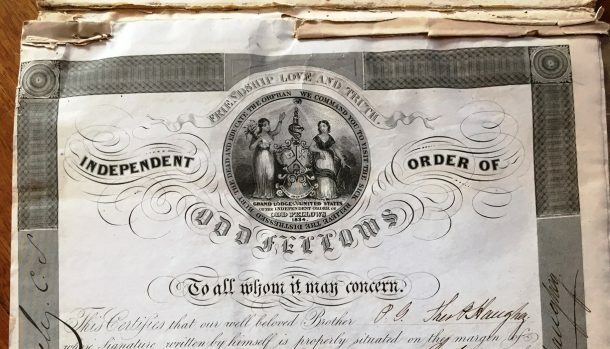 Theodore Haughey’s membership certificate from 1848 is on the first page of the IOOF book. Theodore Haughey was 22 years old when he moved to Indianapolis from Baltimore in 1848. Ambitious and eager to succeed in business, he immediately joined a local Odd Fellows chapter. 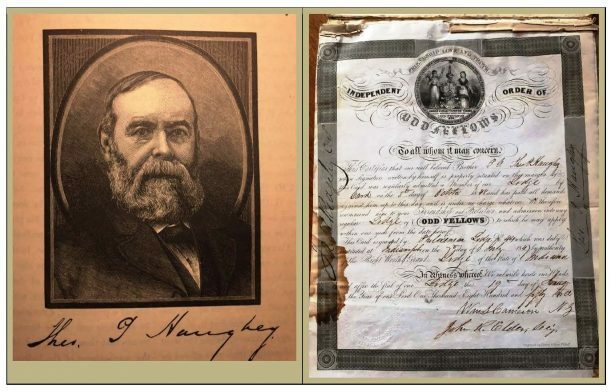 Within a couple of years, Haughey and a handful of his IOOF brothers – including attorney William Wallace, ironworker Benjamin Haugh and future general George McGinnis – decided it was time to establish their own lodge. Haughey rapidly rose to prominence in the Odd Fellows, serving as treasurer of both the statewide Grand Lodge and of Capital Lodge 124. His civic contributions were not limited to IOOF, however. He was a prominent member of the Meridian Street Methodist Episcopal Church, a trustee of Indiana Asbury (now DePauw) University, and a founder of Crown Hill cemetery. 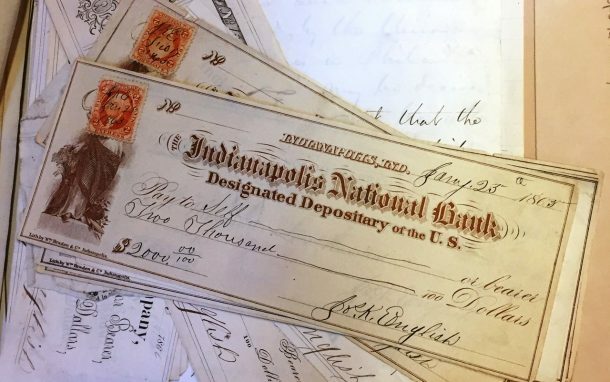 Then in 1864, Theodore Haughey’s career reached a new peak when he was named president of the Indianapolis National Bank. He was not yet 40 years old. The endorser of the check, Joseph K. English, was also a founding member of IOOF Capital Lodge 124. From the Henry K. English collection, Indiana State Library. Before the end of the year, however, the bank would be shuttered and Haughey – along with his son and five other prominent Indianapolis businessmen – would be facing trial for swindling nearly $2 million from friends and colleagues. The Haughey family’s country home in Mapleton (above) stood at the corner of 38th Street and Senate Avenue. Photo from a print of an oil painting. The first sign of trouble appeared in July, when the failure of banks in Louisville and New Albany sparked a run on deposits. Haughey quietly borrowed $20,000 from the other banks in town in an effort to remain solvent. 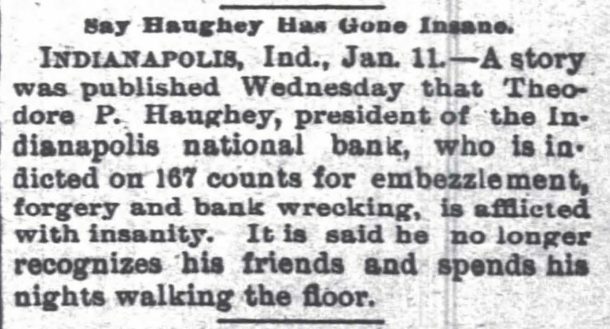 Although Haughey had hoped the loan would keep the Indianapolis National Bank afloat until the bank panic subsided, the situation quickly deteriorated. On July 24, Haughey huddled with other local bankers until late in the evening. Before returning to his country home at Mapleton, Haughey hastily scrawled a message in pencil. Owing to the general financial stringency, the steady withdrawal of deposits, and the difficulty of converting securities into money, this bank is obliged to suspend. That morning at 8 a.m., the chief cashier posted Haughey’s message on the door of the Indianapolis National Bank. The Indianapolis Journal, July 26, 1893; The Maysville, KY Evening Bulletin, July 26, 1893. Within a few short days, however, examiners reviewing the books discovered that something was horribly amiss. 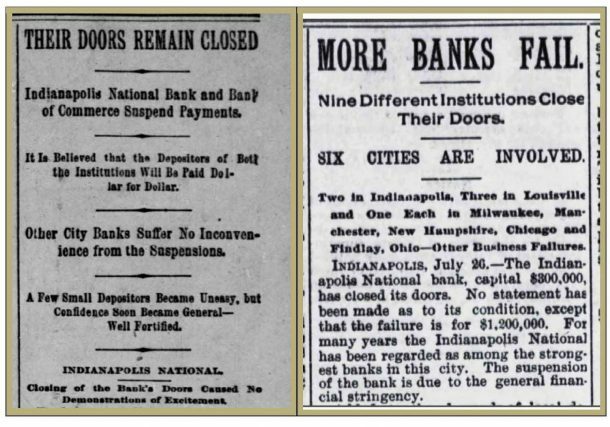 On August 21, 1893 – less than a month after the bank’s failure – warrants were issued for the arrest of Haughey; his son, Schuyler, who was president of the Indianapolis Curled Hair Works and Indianapolis Glue Company; Albert Reed, the bank’s cashier; and Francis Coffin and his brother, Percival, owners of the Indianapolis Cabinet Company. Several others were indicted following a subsequent grand jury investigation. 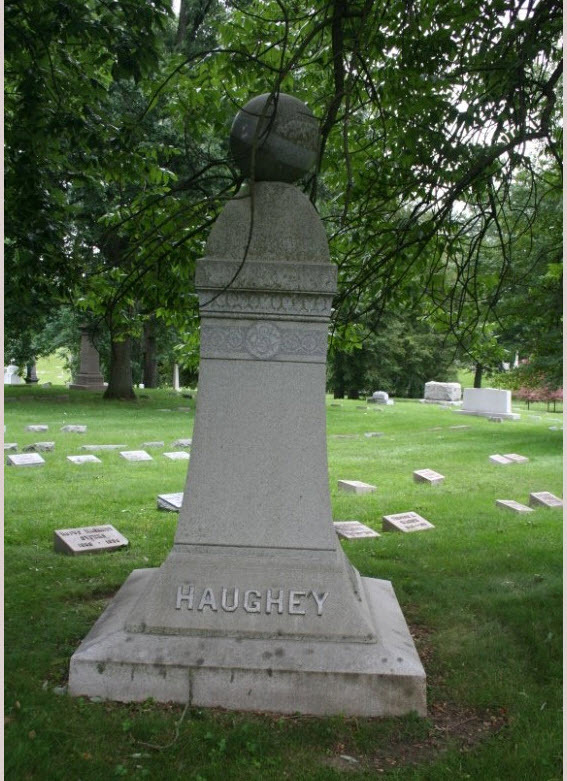 Haughey was charged with embezzling and misappropriating funds from the bank to cover up fraudulent loans issued to the businesses owned by Schuyler Haughey and the Coffins. The other men were charged with aiding and abetting Haughey in his crimes. The Indianapolis News, August 17, 1893; The Richmond Palladium-Item, August 22, 1893. The news of Haughey’s arrest was met with shock in Indianapolis. The destitute children he taught each week in his Sunday School class wrote Haughey a letter of sympathy, and a fellow Sunday School teacher told The Indianapolis News that he would never believe that Haughey did anything wrong. This view was shared by many in the business community, who thought that Haughey – known for his generosity – had simply gotten in over his head in his efforts to aid his son and his friends with their struggling business concerns. But the extent of Haughey’s betrayal became apparent when it was revealed that the long-time IOOF treasurer had deposited nearly $50,000 of the lodge’s funds into the bank under his own name and not in the IOOF accounts. Haughey attempted to make things right with the Odd Fellows by granting IOOF a security interest in his Meridian Street house and other personal property. But those actions failed to lift the burden of guilt from Haughey’s heart. In an effort to spare the Odd Fellows from further embarrassment, Haughey submitted a letter of resignation to the lodge that he had founded 40 years earlier. Many of his Odd Fellow brethren wept in silence as the letter was read. On the eve of trial in April 1894, Haughey pleaded guilty to five of the 167 counts of the indictment returned by the federal grand jury. It was widely believed that Haughey’s plea was an effort to gain leniency for his son Schuyler, who was later acquitted. Haughey was released from prison in April 1898. Three years later, he sold his 39-acre farm in Mapleton to Charles Shover. The Indianapolis News reported that Haughey and his wife would “probably” move to the upscale Blacherne apartments, although no record of their residency can be found in city directories. Mapleton was subsequently subdivided into residential lots. 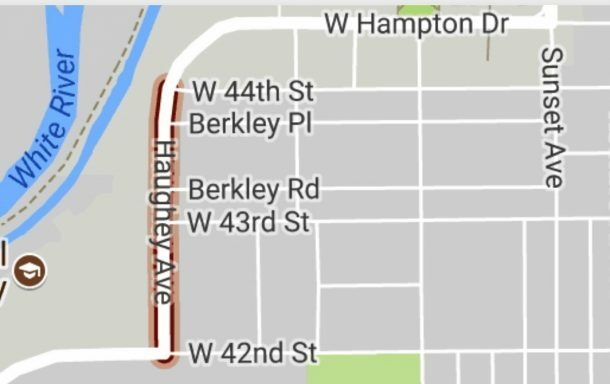 Today, the only reminder of its infamous resident is a small stretch of Haughey Avenue on the Butler University campus. Formerly used as the lodge’s meeting room, the 3rd floor of the Neidhammer is now an event site. Remnants of original decorative painting are still visible behind the old stage. Also shown: a badge from a 1901 IOOF state meeting. 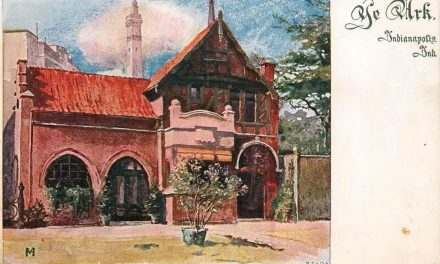 In January 1903, Capital Lodge 124 celebrated its 50th anniversary. The Indianapolis News reported that only two of chapter’s charter members were still alive – Joseph K. English, who was president of the Board of County Commissioners during construction of the since-demolished Marion County Courthouse, and Gen. George McGinnis. There was no mention of Theodore Haughey. At some point after they sold Mapleton, Haughey and his wife Hannah moved in with their eldest son in Wilmington, Delaware. Hannah died there in 1911. When Theodore followed her to the grave three years later, none of the Indianapolis newspapers carried his obituary. Theodore Haughey returned to Indianapolis for a final time in January 1914 for burial in the cemetery that he had helped establish some 40 years earlier. In “The Story of Crown Hill,” published by the Crown Hill Association in 1928, he is described as “a public spirited and useful citizen” who was “personally much liked.” No mention is made of his crimes. 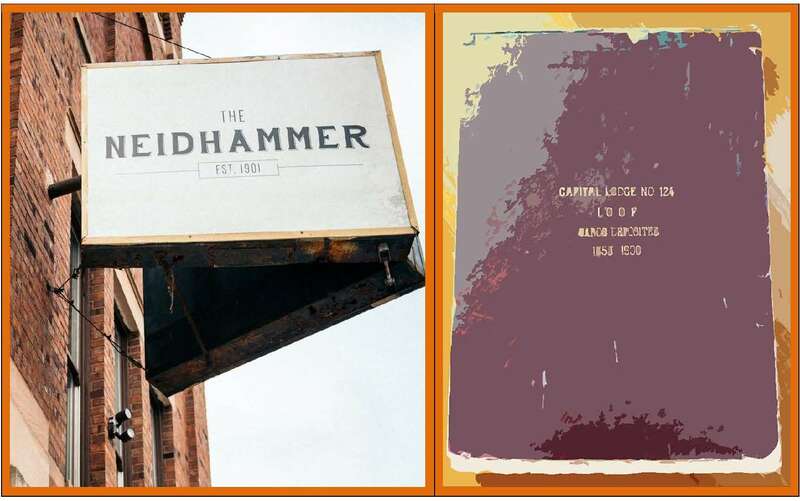 Today, the former home of Capital Lodge 124 houses Neidhammer Coffee and Ash & Elm Cider Company. 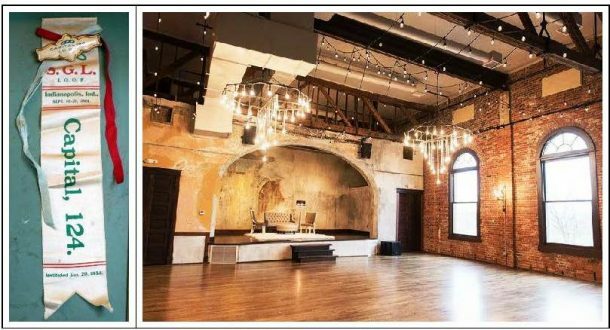 Many of the building’s historical features have been left intact, including cast iron columns, tin ceilings, and exposed brick walls. On any given afternoon, the sunny ground floor is bustling with an eclectic crowd of customers. It is one of my favorite places. To my delight, I recently learned that the Neidhammer’s old walls still have some secrets to tell. In 2015, Joel Walsman and his father Rob purchased the vacant building, which was facing demolition following a disastrous roof collapse. After the new roof was added and the building was stabilized, a family friend asked if she and her fiancé could climb to the top to shoot a skyline view of the city for their wedding invitation. On the way down, Emily Engle caught a glimpse of some yellowed papers through an opening in the attic. 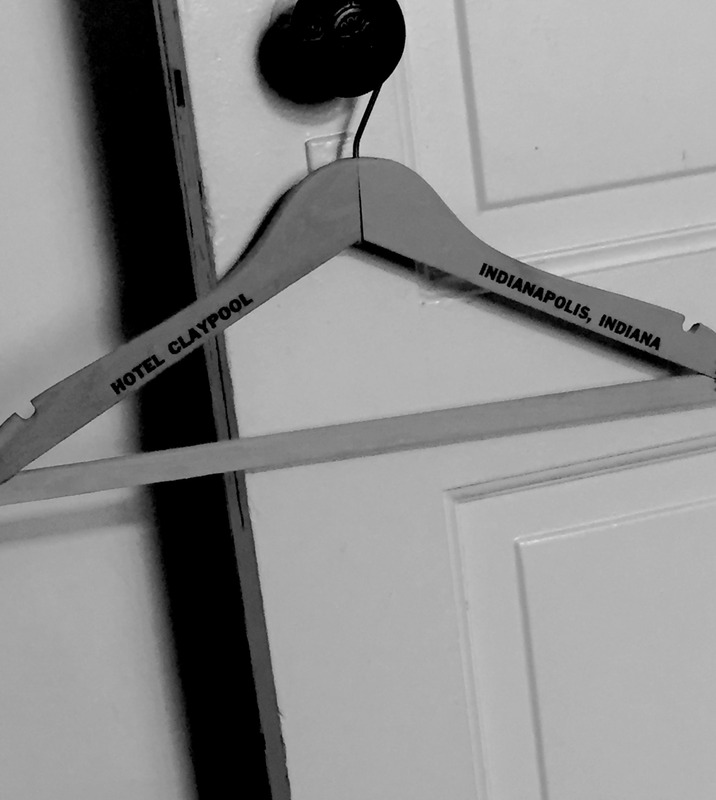 The cloakroom on the 3rd floor still has the narrow closets where IOOF brothers stored their robes. The door with the peephole leads to the meeting room. 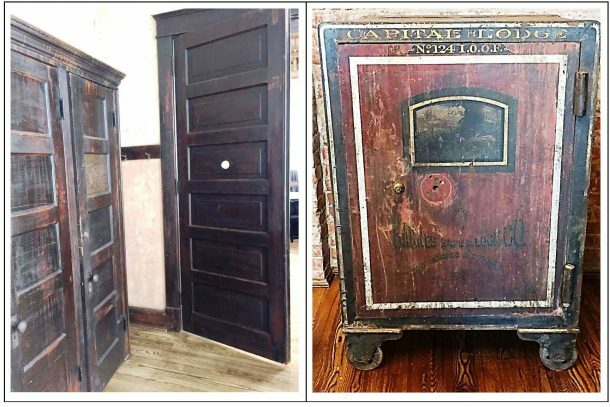 The lodge’s safe was also found in the building, along with a gavel and other ceremonial items. Most people might have just kept on walking. But Emily is currently completing a master’s degree in public history at IUPUI. 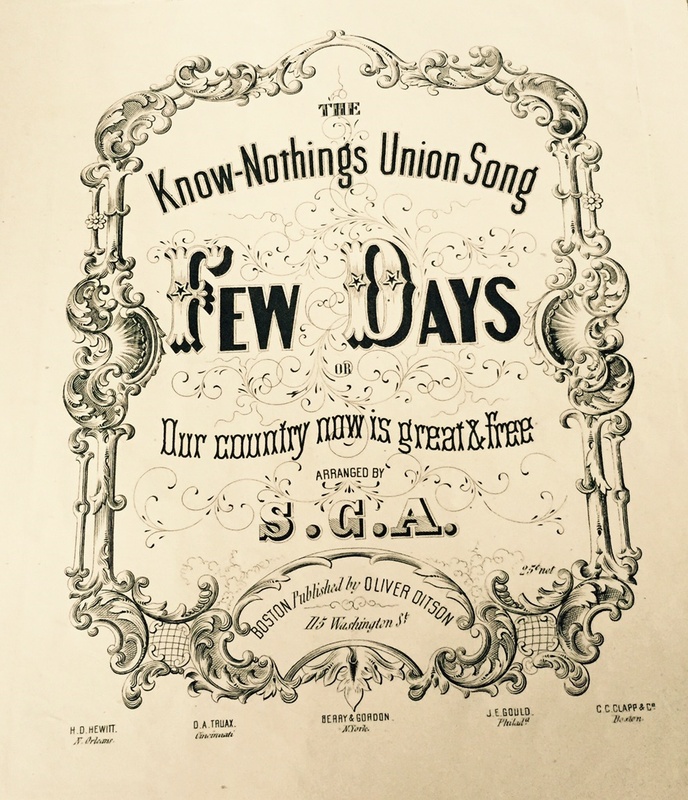 She and her fiancé went digging, and uncovered a dozen bound volumes packed with old Odd Fellows documents, some dating back to the 1840s. Sadly, it seems that some pigeons had discovered the books first. 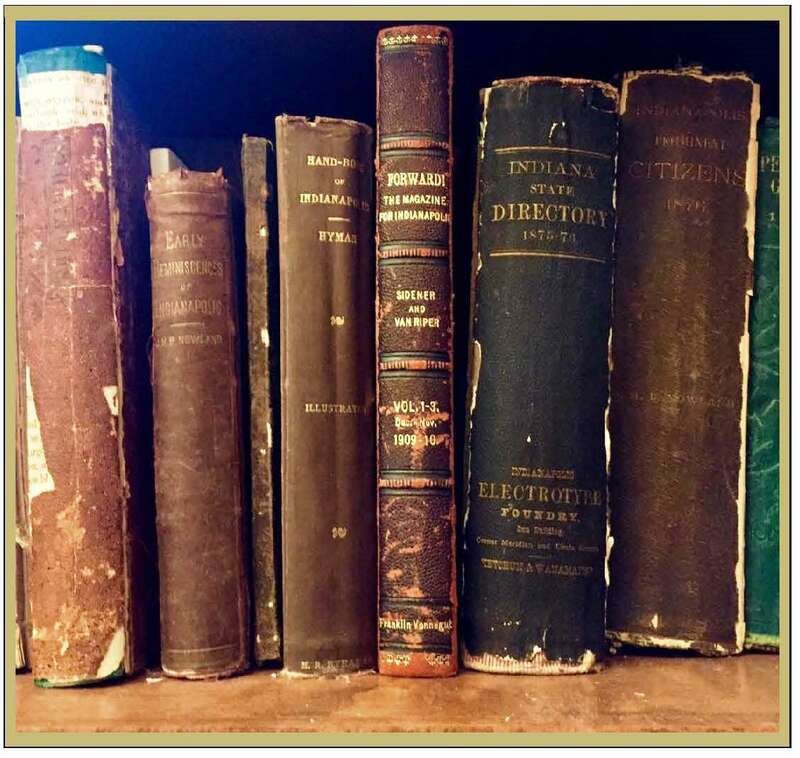 Following the advice of one of her professors, Emily took the books to the experts at IUPUI’s Center for Digital Scholarship. The materials are currently being sanitized and will be assessed for possible digitization as soon as they are safe to handle. Great article! And a cautionary tale for those who may appear to have it all under control.